Holiday Sale - Our Lowest Prices Ever - Limited Time Only! Regularly priced at $24 - $28. 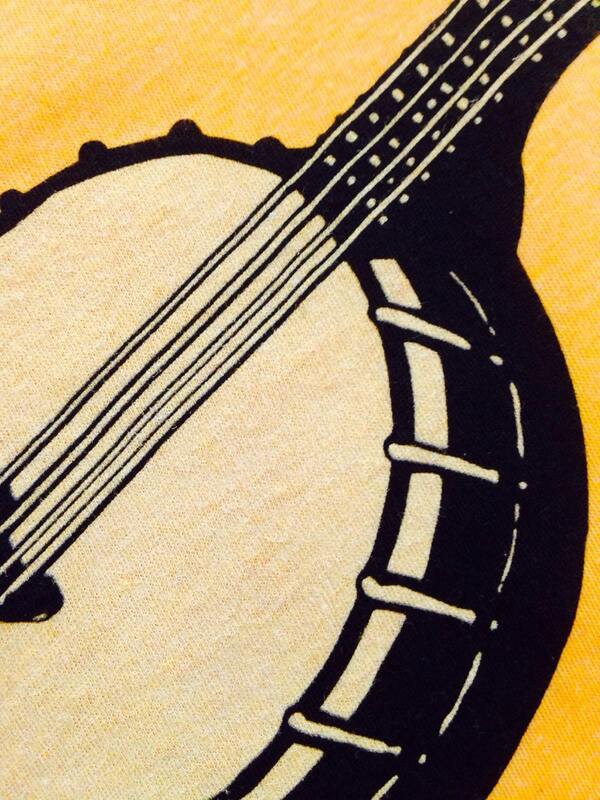 Banjo ukuleles are finally getting the attention they deserve. Loud and proud and ready to join any ukulele meet-up group. 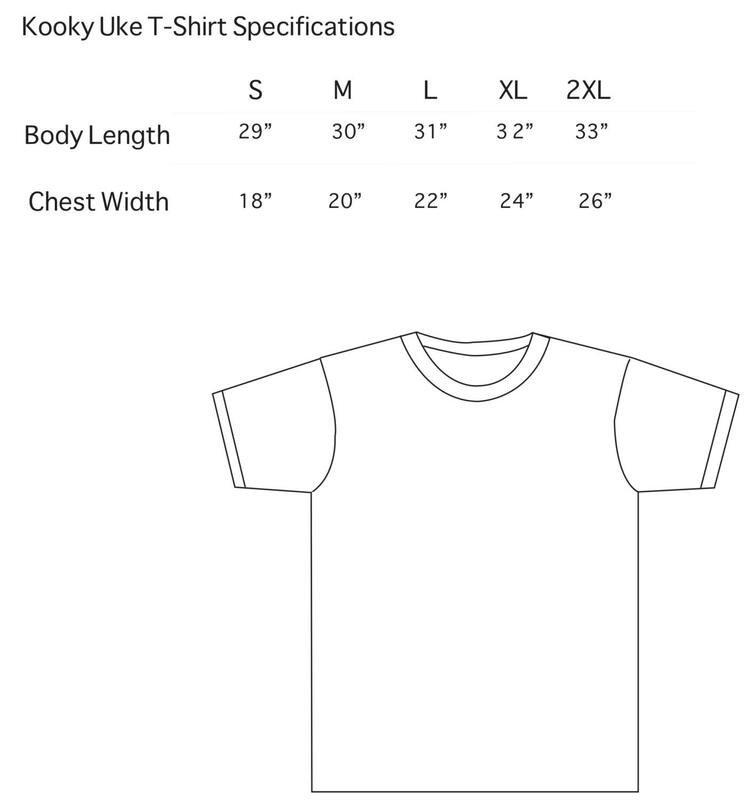 All Kooky Uke t-shirts are designed and screen printed by hand. 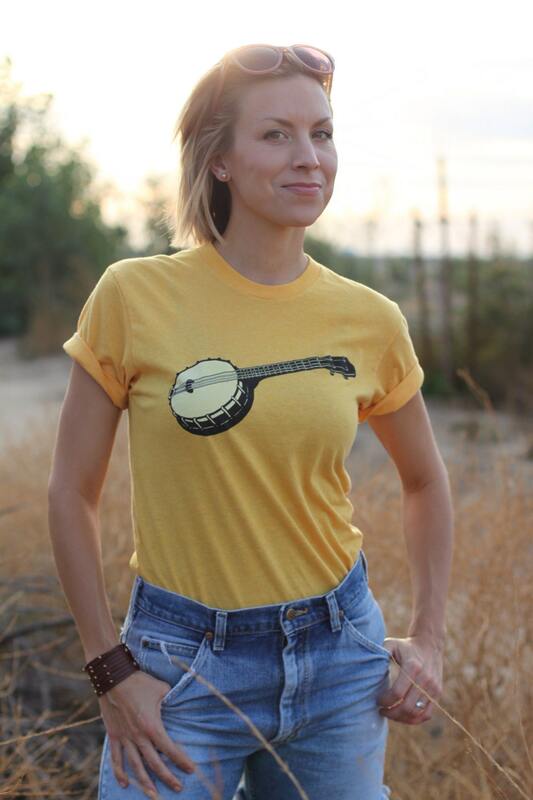 This Kooky Uke design was hand drawn and then screen printed with two colors for a vibrant contrast against bright, heather gold t-shirt. T-shirts are sweatshop free and responsibly sourced. This unisex t-shirt is very light fabric weight, and slightly sheer. Perfect for the summer. It is a poly-cotton blend making is very soft and a slimmer/modern fit. Please see the last photo for sizing specifics. Take a favorite t-shirt and measure it flat from armhole to armhole (seam to seam) across the chest for the chest measurement. For the length, flip the t-shirt over and measure from the seam at the top of the shoulder near the collar to the bottom hem. Then compare it to the sizing chart in the last photo. •	Worldwide Responsible Accreditation: Promotes ethical, humane conditions and practices in all manufacturing facilities. All Kooky Uke Designs hold a copyright and can not be reproduced without permission. E-checks through PayPal are also accepted, but you will need a PayPal account. Orders will be shipped once e-check is cleared. Processing E-checks usually takes 4 business days. All orders are processed within 1 – 3 days after your order is placed. All products posted are ready to be shipped unless noted in the posting. Custom and Special-Tee orders have unique turnaround times because they are made-to-order. Each listing will provide details on the turnaround. We ship directly from the vendor on all custom and Special-Tee orders. It takes 2 - 7 days to print the item and 2 - 5 days to ship it to you. Please allow up to 14 days to receive your item. We ship USPS and the delivery usually takes 3 - 5 days for First Class Mail within the United States. We ship out of Bakersfield, CA. Delivery outside the U.S. generally takes two weeks, and Canadian mail usually takes one month. We offer shipping upgrades of Priority Mail or Priority Express. Options available with cost in item link. I ship from California, USA. I realize international shipping costs are not ideal, but rates are calculated automatically based on the weight of the item. If you are ordering outside of the USA, you may be subject to customs fees. Unfortunately, I can't estimate delivery time on International orders. I have found it takes about 2 to 3 weeks to receive international orders. Every country has different customs fees. For example, I looked into the UK and It looks like anything coming in from outside of the EU above that threshold £15 is charged a customs fee in addition to a handling fee of £8. Unfortunately, that is a country-specific charge and not something we can't handle or advise you on our end. Our shipping labels are generated automatically through Etsy stating the item and the cost and customs uses the information to determine the fees on the receiving end. Please check your customs fees and handling hold times through your postal system prior to ordering. All orders include a tracking number within the United States. All products are nicely wrapped and properly protected. If you would like me to wrap it and include a special note as a gift, please email me through Etsy and I will make sure it is special for that special someone. Unfortunately, Kooky Uke is not able to take responsibility for lost or stolen items. If you would like to purchase insurance for your item, please let us know and we will send you an invoice. Custom and Special-Tee orders have a flat fee for shipping within the United States unless you request a different shipping option. - December 21 (Priority Mail Express). We ship directly from the vendor on all custom and Special-Tee orders. It takes 2 - 7 days to print the item and 2 - 5 days to ship it to you. Please allow up to 14 days to receive your item. Unfortunately, we can't offer gift-wrapping for these items. For holiday shipping within the USA, please order Special-Tee items by November 30. We can't guarantee delivery time for international orders. Please contact us if you want to upgrade your shipping, however, please note it is costly. Holiday ship-by dates are based on the USPS shipping calendar. It is always best to buffer by a few days or more. Please check www.usps.com for holiday calendar and add 2 days for me to process your order in our studio. Kooky Uke is a happy place, so I want you to be happy too. If you are not satisfied with your purchase please contact me immediately. I will do my best to make it right. If you are not happy with your purchase you must notify me through Etsy and return the item to me within 30 days from your purchase date. The item must be sent back in the original condition. Unfortunately, I can't exchange or refund items that have been worn, damaged, covered in pet hair or have an odor. (example: cigarette smoke, perfume, etc.) IPlease notify me immediately if there is a problem with your order and we can discuss how to make it right. All customized and Special-Tee products have unique policies based on the product. Please see individual customized listing for details. Colors of the Kooky Uke products may vary slightly due to the handmade nature of each product or the settings on your computer. Each item is hand-printed, so slight differences in the product may exist. The beauty of screen printing is the richness of color, feel and variation. The process is more involved and time consuming than the more common digitally printed shirts, we only want to produce the best and most artful products printed on sweatshop-free and responsibly sourced products. If you have any questions about the products, please email us and I will be happy to answer your questions or provide additional pictures so you feel confident in your purchase. We do offer wholesale through Etsy for certified buyers. Please visit our store through the Esty's wholesale program. To fulfill your order, you must provide me with certain information (which you authorized Etsy to provide to me), such as your name, email address, postal address, payment information, and the details of the product that you’re ordering. You may also choose to provide me with additional personal information (for a custom t-shirt order, for example) if you contact me directly. - Compliance with laws. I may collect, use, retain, and share your information if I have a good faith belief that it is reasonably necessary to (a) respond to legal process or to government requests; (b) enforce my agreements, terms and policies; (c) prevent, investigate, and address fraud and other illegal activity, security, or technical issues; or (d) protect the rights, property, and safety of my customers, or others. We are located in the United States and store and process your information through third-party hosting services in the US and other jurisdictions. As a result, I may transfer your personal information to a jurisdiction with different data protection and government surveillance laws than your jurisdiction. For purposes of EU data protection law, I, Julia Heatherwick, am the data controller of your personal information. If you have any questions or concerns, you may contact me at KookyUkeKookyYou@gmail.com.